The away team and I have been exploring a planet located in the Romulan Empire close to the Klingon boarder. 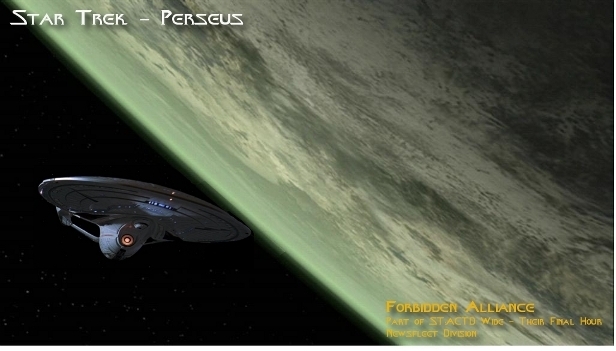 We had to leave the Perseus behind in Federation space as we conduct our mission to try and stop an alliance that Starfleet believes is orchestrated by the Vroa. I do find it hard to believe that our Klingon allies would turn against an alliance that has been in place for decades, but anything could happen when it comes to the Vroa. I have instructed the away team to maintain radio silence as we get to the bottom of this. One thing that is for certain is that we cannot let this alliance between the Romulans and the Klingons became a reality. It will be detrimental to the Federation as we know it. I'm for one would like to complete the mission as soon as possible since this planet is starting to get to me. The heat mixed with the Cardassian make-up is barely bearable. Edited 1 time(s). Last edit at 09/04/2013 12:23AM by Mike Yan.